Each year at Christmas we create a memorable out reach that draws approximately 70,000 individuals from our surrounding communities. Needless to say, it’s an extremely large undertaking and responsibility on making decisions toward the scenic support. The month of September is noted for one thing with production and programming staff at Willow, final decisions need to be made toward the Christmas project, so all departments have enough time to develop the Christmas experience. Of course, even after the final decisions the revisions are ongoing. There are changes coming down the line as late as a few days before the event. This year, the go button, was pushed at the end of October, which made the scenic construction four weeks late. There was no room for mistakes; no time in the schedule to redo, all of us have to do our homework, to make the design and construction with precision. An example of hours spent toward scenic elements can be as high as 2800 hours of construction This year 1000 hours were spent toward the 5 scenic elements needed; a 36’round stage with a 24’ motorized turntable incorporated, 1000 small lights placed randomly throughout the auditorium and stage, 5 band wagons, and two 48’ x 23’ video screens. Now taking on any large project like this can be overwhelming. You need the ability to evaluate, manage and master scheduling. Then there is the other stuff such as ordering materials, load-in of materials, construction, staying within budget, meetings, and volunteers, any of those can sway the success or failure of a project, the constraints of staying on time. It was decided early on that our main focus was to be toward the subject of, “Fear Not” as mentioned in the bible from the angel Gabriel to Mary, Joseph, and the shepherds. A “modern” day story about the birth of Christ was written involving various actors depicting Mary, Joseph and the shepherds. It was a conscience from the beginning for this to happen the actors and audience needed to feel an intimate setting, a setting that the audience walks into a real environment and experiences it. To accomplish this two things were decided upon. First we would create a thrust stage with a surface that could be drenched with projected video juice and rotating gobos to creating movement in every scene as an individual painting. Second, we would create1000 lights fixtures that can twinkle creating a real field of stars that serve toward creating an intimate setting. Plans began underway to create a large enough thrust stage with plenty of room for actors, several musicians and individual singers. 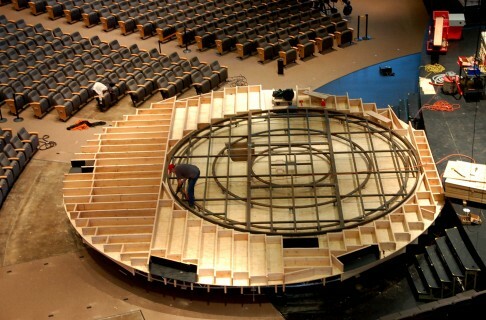 The design of a 36’ round stage was an appropriate size and shape as it related to what was needed. Now building a 36’ round platform that is 3’ tall is not that complicated. But when you consider having to, include concave areas for audio speaker placement, incorporate a motorized 24′ turntable within limited space, and oh did I forget to tell you it had to be in place and finished in a week, so it would not disrupt our weekend services, these details become a highly complex challenge. To create the thrust stage over 600 hours was needed to complete it. I decided to make the platform as a portable unit so, we could actually build the stage in a room behind our existing stage over a 3 week period, instead of trying to cram everything into one week. The platform needed to be a standard wood construction that would be exceedingly strong to support a group of people, 5 band wagons and the worship team’s instruments. After calculating the weight of the construction materials, the sheer weight of this platform came in at over 18,000 lbs… The challenge was the weight of the platform needed to be under 9,000 lbs. for the casters not to be overloaded and most importantly to be able to lift the stage by motor hoists from our existing stage onto the audience level three feet down. So, I decided to create a multi-tiered level stage. We could finish the first two levels and keep it under 9,000 lbs. The third level could be finished once it was in place. The first level consisted of a 20.5” aluminum truss system to support the enormous weight with tri-casters installed to make it portable. The second level became a subfloor made up of 2×10 joists set up on 16” centers and ¾” plywood for the decking. This was used to support the 3000 lbs metal turntable. Under the belly of this structure, we would create two compartments to house the turntable motor units. Once the floor was finished, we would place 36 casters up at strategic locations to act as support and guides for the track of the turntable. The third level was also made up of 2×10 joists set up on 16” centers that would match the height of the turntable. Once all was in place, a ¾” plywood decking and ¾ homasote board was added to create the floor surface. The homasote board was used to deaden the sound of foot traffic and turntable noise. I must say to create a workable stage turntable that turns at the right speed and is quite, became quickly problematic. A scene in the drama script included an actor representing Joseph running away from Mary. The turntable would allow him to run but stay in one place, while video projection makes him look as if he’s running outdoors. Upon preliminary testing, we realized two things, our motors were not fast enough, 1 mph instead of the needed 6 mph and the noise of the motors and casters were extremely loud. To correct those issues we used 5” soft rubber casters, instead of hard plastic ones, ordered the corrected gear boxes for our motors and added insulation in between the joist to deaden the noise. November 29th was an extremely busy day for us all. Lighting was doing their load-in of rental gear onto the main stage while the construction workers, lifts, and tools were at work on lifting the stage in place and completing the construction. We were constantly battling for a clear space in order to get our job done on time. On December 3rd. we finished the stage by giving it a final coat of light gray paint for video projection. The round thrust stage created a nice relationship between the actors and audience and changed the feel of the entire auditorium. Everyone was amazed at how realistic the texture of the video content was on the stage surface. With the use of Pandoras Media Pro Server, four Barco FLM HD 20k projectors, two for the large screens and two for the stage floor surface the brightness and clarity of the video effects was incredible. The video and lighting imagery powerfully enhanced the experience. The 1000 light star field was stunning. We were extremely pleased with the outcome. So the question is always asked, “Is it too large of an undertaking?” How could you ever compare the valuable results of 70,000 individuals who were indefinitely affected by the testimony of a Christ experience to 1000 hours spent? We are truly humbled to be able to use our gifts toward such a prize as this.